When you add a bull to your attractions you add excitement and fun for every one. Not only is the rider challenged but the crowd loves to watch them to see if they can stay on. In many locations the operator does not necessarily operate the bull as if you are actually riding one. They have control to slow it down or make the bull move in amusing ways. Riding a mechanical bull in the night club seen is all about creating fun. Mechanical Bulls make fun that gets the whole crowd into it and creates an exiting atmosphere. We have the most reliable American made and supported Mechanical Bull at the very bet price available. 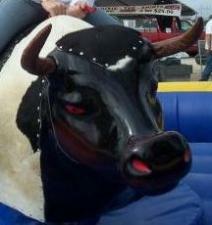 The following information is all about the Mechanical Bulls we have for sale. 2 – 1 hp motors control Buck, Spin and roll (2000 lbs of torque). settlement funding on Zip-line and Funny girl riding the Mechanical Bull at The Grand Opening of the Music City Center.